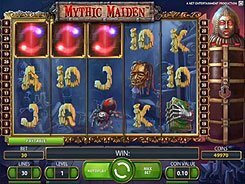 This is a 5-reel 30-payline video slot that will transport you to an old haunted house cluttered with weird artifacts that once belonged to a witch. On the reels you will find a strange-looking mask, a spider, an animal skull, and some other thrilling symbols as well as playing cards from 10 to Ace designed to look like candles of various shapes. 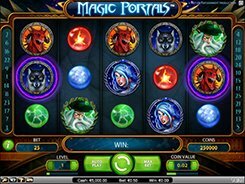 A bet size adjusted from $0.01 to $150 per spin makes the slot appealing to new players and high rollers alike. A wild represented by the Full Moon substitutes for other icons and triples payouts when substituting. 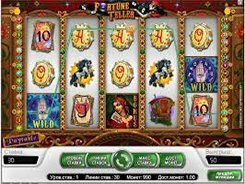 Besides, you can benefit from 10, 15 or 30 free spins triggered by three, four or five scatter symbols landed in any position. 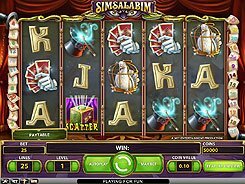 During the free spins, a sarcophagus shown to the right of the reels is open and randomly awards one or more extra free spins and/or a multiplier of up to x10 times a bet. The top three awards that can be won in the game are $10000, $5000 and $500 respectively.